A total of 14 212 students at Bulgarian universities and specialised higher schools in the 2017/18 academic year are foreigners, the largest group – about a quarter – being from Greece, the National Statistical Institute (NSI) said on April 27. The second-largest group of foreigners at Bulgarian universities were from the United Kingdom (14.1 per cent), followed by students from Turkey (10.5 per cent), Germany (8.6 per cent) and Ukraine (5.4 per cent), the NSI said. 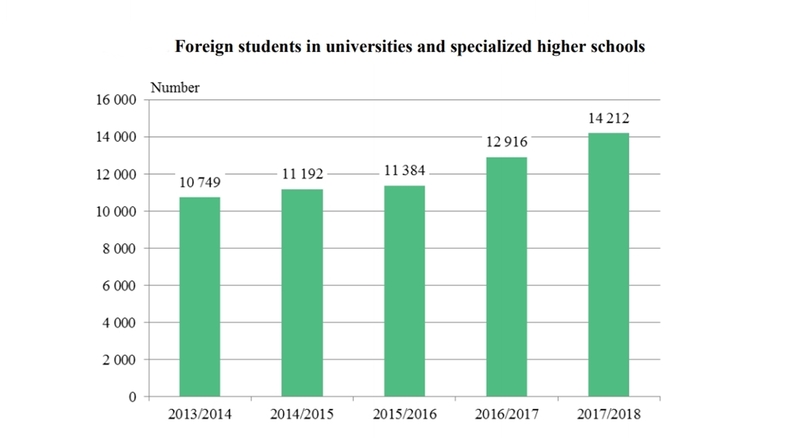 The number of foreign students at Bulgarian universities in 2017/18 was 10 per cent higher than in 2016/17 and about a third more than in the 2013/14 academic year. The NSI said that there were 529 Ph.D students who were foreigners, 8.1 per cent of the total number. Of the Ph.D students who were foreigners, the largest number were from Greece, 26.8 per cent, followed by Turkey (14 per cent) and Kazakhstan (8.9 per cent). The institute said that of the total number of Ph.D students in Bulgaria currently, 4.5 per cent were training in private institutions. Of these, 112, or 38.2 per cent, were foreigners, NSI said.